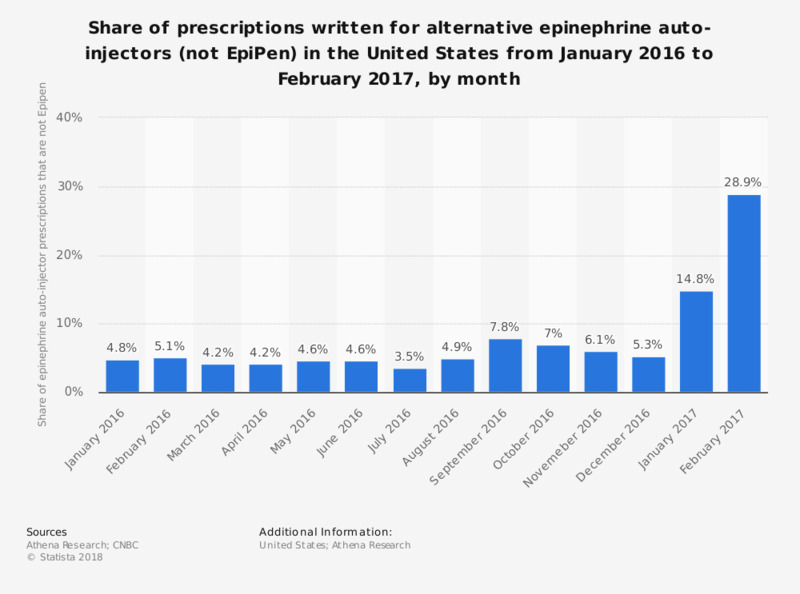 This statistic shows the share of prescriptions written for alternative epinephrine auto-injectors (not EpiPen) in the United States from January 2016 to February 2017, by month. In the month of February 2017 the share of prescriptions written for alternative epinephrine auto-injectors was 28.9 percent, a massive increase from just 5.1 percent a year earlier. Mylan's EpiPen has seen significant price increases since 2009, reaching a wholesale price of 609 U.S. dollars in May 2016, despite the drug and device costing Mylan only 35 dollars. The EpiPen and other epinephrine autoinjectors are medical devices mainly used to treat severe allergic reactions. Data current though February 25, 2017.